Mainstreet Cleveland, Allied Arts Council of the Cleveland/Bradley Chamber of Commerce and city planners opened the Back Alley Gallery. The alley links First and Second Streets behind Craigmiles Hall. Anyone walking through the alley can open the doors. Behind each door is a work of art. 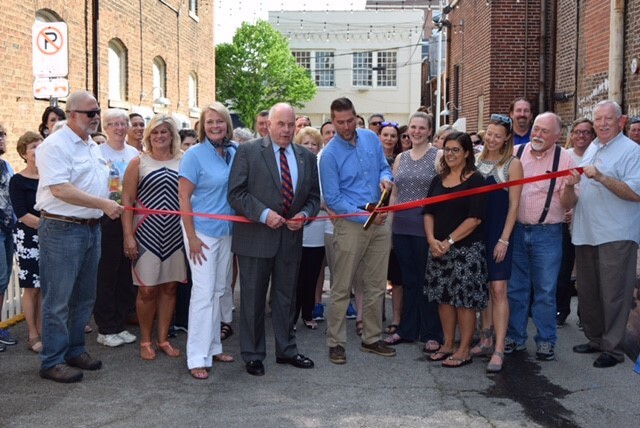 After a ribbon cutting ceremony for the Back Alley Gallery, the downtown’s attention turned to the Bradley County Courthouse Square. Sponsored by Wacker, the first in a series of summer First Friday Festivals concerts sounded off. The series’ first band was local favorite Convertibull. The band packed many old-time rock and roll numbers into an hour. The crowd enjoyed a row of food vendors, inflatables and free face painting. During the intermission, storyteller Jude Baker entertained festival goers. The festival ended with a performance by the Entice Band, a Nashville area band. First Friday Festivals continue July 7 and August 4 starting at 6:30 p.m.